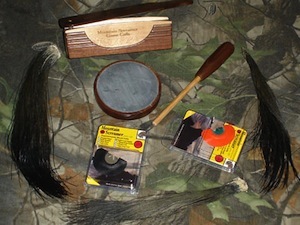 For many, many years I have been touting the importance of being proficient with as many different types of turkey calls as possible. The versatility of using several calls makes you much more effective as the gobbler�s preferences are not consistent and can change from one day to the next. I hunt one particular property where I have documented that the gobblers do not respond well to the box call. I have worked a half-dozen toms into sight there with a box call without getting a shot. 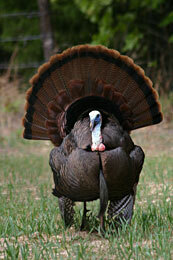 Every time I switched to my slate call I walked out with a gobbler over my shoulder. I have had other hunts where the only call a bird would answer was a diaphragm call. The pitch of each call is unique and sometimes only a certain pitch will work. There is also a distinct advantage in using two different calls on the same hunt. A great example of this happened just a couple of weeks ago with my middle step-son Spencer and me. Spencer is now a Banker in Chicago and gets home a few times each year. One of those times was recently to turkey hunt. I think I was looking forward to our time together in the woods as much as he was. I scouted one of our favorite spots and set-up a blind just in case it was raining on the only day Spencer had to hunt. 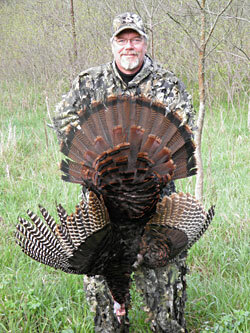 Coming home on Easter weekend is a very busy time and Saturday morning was his only window to get with a gobbler. I wanted to give him every possible advantage. We got to the blind plenty early and got the decoys out well before first gobble. When the toms woke-up there was a gobbler north of us several hundred yards and two or three screaming toms to our south about as far out. Since we were already set we decided to go ahead and try calling from the blind. Spencer assists me on the MOUNTAIN SCREAMER GAME CALLS Pro Hunting Staff which I Direct. His choice was a box call and his first series was answered by a bird to our south. That was very encouraging. Over the next hour many calls and many gobbles culminated in absolutely nothing. The birds hit the ground, found their strut zones and stayed put. They would gobble on their own and even answer Spence�s call, but they would not move. Sometimes the best thing to do with toms that will not budge is to go to them. So we did. Spencer wanted to make a move to the south to put us closer to the greater number of gobbling toms. I knew of a bottom field along the creek that would easily split the distance between us and the turkeys. We made the move quickly and quietly and were set at 7:30. There had not been a gobble since just before we moved. We put out three decoys. I use a strutting jake called the B-Mobile from PRIMOS and two real hen decoys from HAZEL CREEK DECOYS. I put a real fan on the jake making this decoy spread irresistible to mature gobblers. Jakes will come to them too, but adult toms hate seeing a jake with two hens in the spring. Spencer made a couple of calling sequences with his box with no response. The toms had shut down gobbling completely. It was deadly quiet. I knew hens had been on nests for a couple of weeks so I was confident they were not henned-up. We just had to exercise some patience�or not. About 15-minutes from the time we sat down a gobble rang out from down the creek about 150-yards. Spencer played hard to get and did not answer. 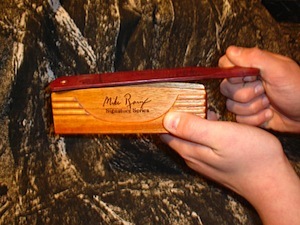 A few minutes passed and Spence made a few light yelps on the box. The tom answered immediately from about 100-yards. My young partner put the call down and picked-up his gun. This was a very smart move for two reasons; first, getting caught by a gobbler with your gun in your lap is inexcusable. Second, he knew I was 10-yards behind him with the video camera and could make another call if needed. Just seconds later Spencer turned his head slightly and whispered that the gobbler was in the field. I saw the tom strutting at about 85-yards. He was turning circles as he spit and drummed trying to intimidate the jake and attract the hens. I picked-up my MOUNTAIN SCREAMER slate call and made three gobbler clucks. The tom�s reaction was priceless. Staying in full-strut he ran toward the decoys as fast as he could in that position. He slowed down at 50-yards and I clucked twice more. Now he was totally committed and came right to the three impersonators. Spencer had his 12-gauge magnum loaded with FEDERAL�S new #7 shot turkey loads. The huge black bird was strutting between the hens when I made a single putt with my voice. When he raised his head to look, Spencer�s shot went right threw it. At 8:05AM on Spencer Dietrich�s only day to hunt spring gobblers in 2011 he put a 23.5-pound bird with an 11-inch beard on the ground. Hugs and high-fives were followed by a short photo session. I had a smile from ear-to-ear when Spencer said, "We�re still a pretty good team."